Mohammed Ahmed Mian, Director General Pakistan Post and Secretary Postal Services Division in his speech highlighted the salient features of the service. He also mentioned that the customers can not only remit money to their kith and kins and friends through mobile SMS but can also withdraw or deposit up to Rs 10,000. This can be done by simply filling out a form that will be available at authorized PPO branches across the country upon launch. Once they are submitted, within 24 hours customers will be able to send and receive money orders at their convenience to Mobilink users via SMS anywhere in Pakistan. 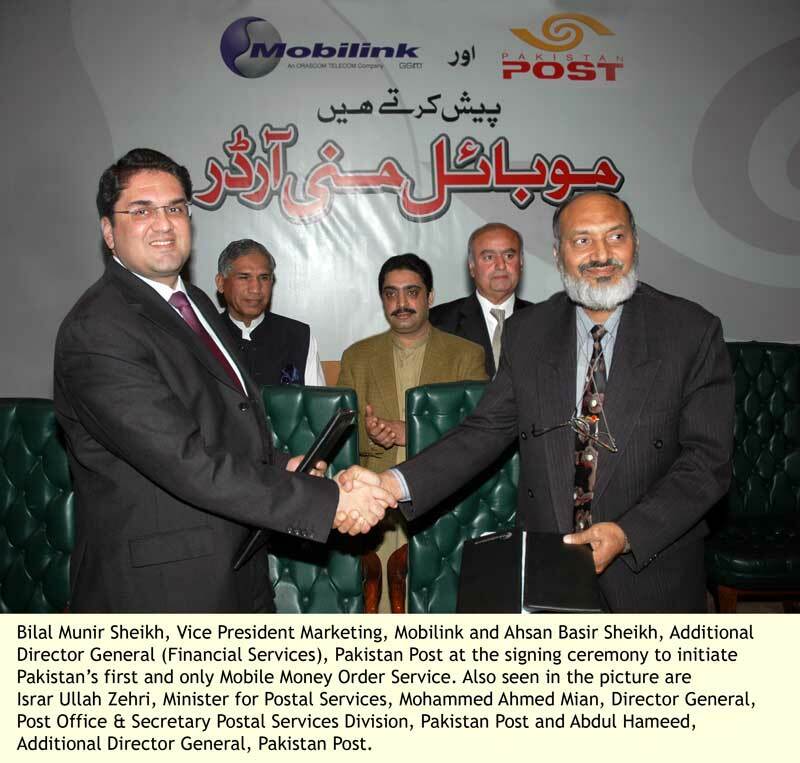 The Mobile Money Order Service is in line with Mobilink’s principal aim of connecting the unconnected and providing unique products and services to the consumers, especially the underserved sections of society. In the past, Mobilink has introduced various socially inclusive products such as Mobilink PCO, a self-employment solution enabling people from all walks of life to earn a secured livelihood, and Mobilink Kisan Service, an IVR based service providing farmers access to price & weather information along with valuable advice on harvesting matters. Mobilink will continue to introduce more such service in the near future as well that are novel, socially inclusive, improve accessibility and connect the people of Pakistan in ways that truly reshape their lives. god information give..thanks for this post. The Mobile Money Order Service is good and latest technology to only remit money to their kith and kins and friends through mobile SMS but can also withdraw or deposit up to Rs 10,000.But PPO staff dealing/way to behave with customer alarming that may be changed by arranging trainings to staff.